It’s all OK now. We finally saw a leopard. Yesterday afternoon we were about to have showers – a process involving some significant negotiation – when one of the staff came to our tent and said that (a) the water was ready and (b) Harry, our guide, had something he wanted us to see – what did we want to do? Of course we went out with Harry. 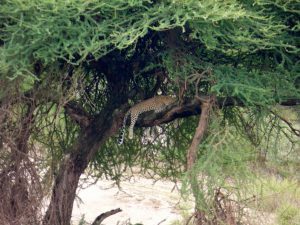 Draped over the thick limb of a tree was a leopard. So that was a good thing. Almost immediately two things happened: The leopard climbed down into the grasses beneath the tree, and 20 other trucks pulled up. We spent the next couple of hours waiting for the trucks to lose patience, which happened one-by-one, and the leopard to reappear, which never happened. Beautiful evening to be out watching a tree though. This morning we set out South to try to track down the herds of wildebeest. Very quickly we came across a pride of lions with a kill, fending off a larger group of hyenas and jackals. We spent ages just watching the play unfold as the hyenas circled in closer and the lions fended them off. Step-by-step the hyenas got closer until they managed to trick the remaining lion into chasing part of the pack North while the other hyenas grabbed the body. 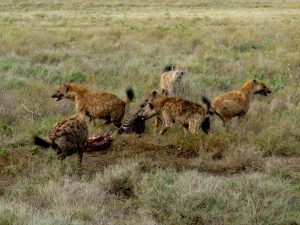 The amazing thing was the way the hyenas all started barking at each other and jumping all over each other in search of a share. Meanwhile the jackals were darting in and stealing morsels. The whole thing was probably the best thing we’ve seen in our time in Africa. We did find the herds forming, so saw lots of wildebeest and zebra but nothing like the masses that will form over the next few days. The highlight of the late morning was watching a cheetah with four cubs edge closer to antelope. We were all hoping the cheetah would burst into a run and go for one of the antelope, but it never happened. While all this waiting and watching is happening, there’s always more to see, especially now it has rained. From giraffes in the distance, to birds, to, today, lots of dung beetles rolling balls across the plain.